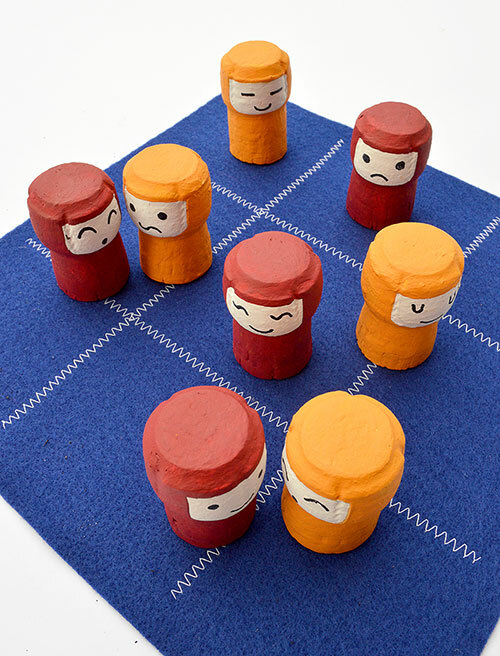 Entertain the kids with this DIY Take along game of tic tac toe! 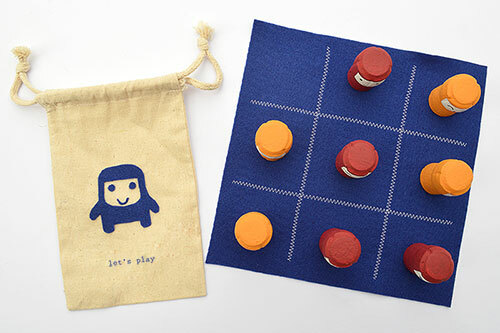 It is a fun kids activity that will keep kids happy even on long road trips. If you are looking for more boredom busting ideas check out all our summer crafts and activities ideas to keep kids active and entertained this summer! The best craft bloggers are sharing fun kids crafts! From making Pom pom bracelets to DIY Coloring Books you will find fun creative ideas! Need a movie inspired craft? Check out this easy DIY PVC bow and arrow to bring the excitement of the movie Brave to your backyard! Hello Skip to My Lou readers! I am Michelle from MollyMooCrafts, where I blog about crafts for kids and crafts for parents to make with and for their kids. Today I am sharing a fun and quick craft for summer that will keep your kiddos engaged and entertained during the holidays, on long car journeys and long after the summer is over! We are big fans of wine cork crafting in our house, such a versatile material for making miniature toy characters to inspire play. Our local Italian restaurant fills a bag of champagne and wine corks whenever our stash is running low. An inexpensive alternative to peg dolls the options for play are limitless – be inspired by these sets of cute and playful animals, superheros, easter bunnies, circus troop, halloween trick ‘r treat kids and DIY Stamps. TODAY’S game is a play on all those smileys and emoticons that our kids love so much – it will encourage play, strategic thinking and just playing fair!!! kids are so good at that! Start by painting the corks white to cover the graphics and leave aside to dry. Then with a pencil lightly draw the outline of the face on each cork and use this line as a guide for painting outside with the main colors. You need to paint four corks in one cork and the balance in another contrasting color – the opposition!! 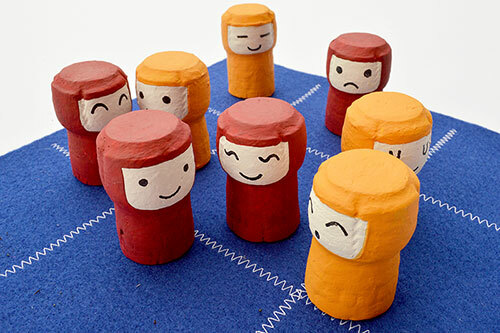 When dry the kids will really enjoy adding the character to each cork, which one is happy, grumpy and confused? 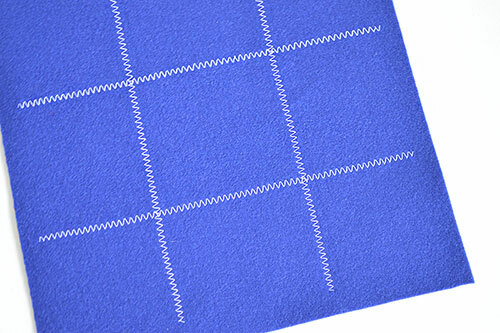 Now to play you can simply have a sheet of paper and some pencils to make the tic tac toe grid or if you want something more permanent that the kids can come and go to, again and again and again, just cut a piece of craft felt into a square and sew on some quick grid lines with zig-zag stitching. Easy, even for someone who can only sew in straight lines like myself!!! I’ll get there…. eventually!! Time to get your crafty pants on! Catch the rest of the Fun crafts for Kids! series on Skip to My Lou – there’s a new project every day for 30 days! Michelle here! I’m a graphic designer and mum of one little girl called Molly from Ireland – MollyMoo is my virtual home filled with fun and colorful unique and cute crafts for children and their parents. I am a freelance craft writer for KidsActivitiesBlog. Some of my post popular posts include craft tutorials for Pom Pom Hedgehogs, Popsicle Stick Bracelets, Dreamcatchers, Cardboard Box Aquarium, Cardboard Box Pirate Ship and Toilet Roll Minions. You can find me on Facebook, Instagram, and Twitter and one of my favorite places to hang out is on Pinterest. Even better, get all my posts sent to your email weekly! I'm in love with these! I love how they each have individual faces!